Automating case packing, the last manual process on its production line, was proving a challenge for Northern Foods, the manufacturers of Fox’s Biscuits. We worked closely with Northern Foods to demonstrate the potential of the Casepacker solution. The machine features a touch-screen interface which makes it possible for operators to change between the fourteen different products which the line currently handles in seconds. The straightforward menu-driven programming system means that technicians at Northern Foods can quickly and easily reconfigure the system to handle any new pack sizes which may be needed in future, without having to rely on external support. A similar menu-based interface gives access to the powerful yet easy-to-use diagnostic facilities which are built into the system. The new Casepacker and its associated carton erector also proved easy to link with the production line’s existing control systems enabling, for example, upstream processes to be halted temporarily if the case packer runs out of cartons. The Rtheta™ Casepacker is based on direct drive from two brushless servomotors. No gearboxes are needed, which not only eliminates positional errors due to backlash, but also greatly reduces maintenance requirements. The machine is compact, and suitable for mounting above the production line. In the case of Northern Foods, this meant that no additional factory floor space was needed. The machine quickly proved its capabilities, meeting Northern Foods’ target of handling over 100 packs per minute with ease, using just a single vacuum pick-up head which can be changed rapidly to suit different types of biscuit packaging. “When we first saw the Rtheta™ Casepacker, we were a little wary of its radically different design. However, the specification appeared to meet all of our requirements and the price – about half that of the other systems we’d looked at – was certainly attractive. It has now been operating 24-hours a day over the last couple of months, and its reliability has proved to be excellent. 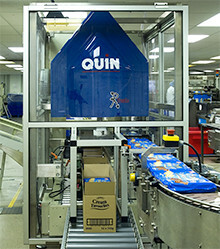 Based on our experiences, we believe that Quin’s Rtheta™ Casepacker has huge potential within Northern Foods – by eliminating the need for manual case packing, it has cut our costs substantially, and it will have a very short pay-back period, especially when its low initial cost is taken into account.” Rick Lloyd, Chief Engineer.